ST PATRICK'S Athletic Football Club have released a statement revealing their frustration at Dublin City Council's decision to ignore their plan for the St Michael's Estate area of Inchicore, a site in which the League of Ireland club have offered to build a new stadium, town centre, housing and retail facilities. A year on from the launch of their proposals to build the 12,000-seater Richmond Arena, private and social housing, retail spaces and underground car parking, the Saints have urged Inchicore residents to tell their local councillors of their support for their plan, which they claim is more beneficial to the area. St Pat's have also offered their current home of Richmond Park, which is located beside the St Michael's site, for redevelopment which they believe will more than satisfy the need for private and social housing in the area. Last July, at Richmond Barracks, Inchicore, the Minister for Housing, Planning and Local Government, Eoghan Murphy TD announced a rival plan for the St Michael's area which featured only housing. That proposal was slammed by Murphy's Fine Gael colleague and local TD Catherine Byrne, who claimed the scheme would "destroy" the local community. 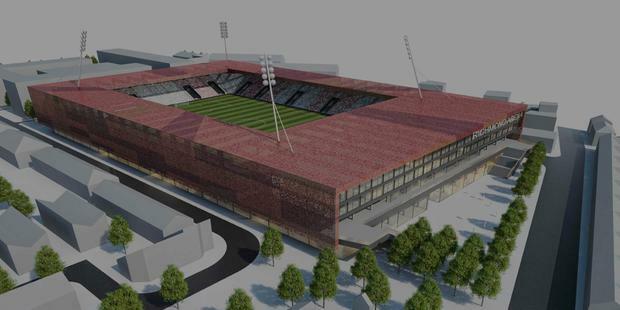 "Just one year ago, on 11 April 2018, we announced our proposal for the development of the Richmond Arena, a new Town Centre to provide retail and community facilities that are sorely missing in Inchicore, incorporating a state-of-the-art 12,000-seat stadium. This proposal was developed over a decade of very detailed planning, involving internationally renowned and respected names in architecture and project management. "It did not require any investment of public money. In addition, the proposal involved providing very substantial new housing units on both St Michael's Estate, where the Richmond Arena would be located, and on the Richmond Park site of our current stadium. We made it clear that the density, mix and configuration of the housing part of the proposal could meet whatever requirements were specified by Dublin City Council. "Our proposal was an imaginative and very feasible solution to some key needs of Dublin City - the City Development Plan envisages the development of a high-quality, vibrant, mixed-use urban quarter which will help to regenerate Inchicore, while the housing crisis is the most critical issue facing our city. "Had our proposal been accepted, we would now be looking at a realistic date of 2022 for completion of this project, with all of the benefits it would bring to Inchicore and West Dublin more generally. "We are extremely disappointed and frustrated that, under pressure from the Department of Housing, Planning and Local Government, Dublin City Council, as of now, is planning a much more limited development of St Michael's Estate which will throw away, forever, the once-off opportunity which our proposal offers for a major enhancement of Inchicore. "By foregoing the chance to develop both sites, as in our plan, the City Council will lose the opportunity to provide comprehensive retail and community facilities and will make no provision at all for parking (as compared to several hundred spaces in our plan) while the housing part of their proposal offers nothing, either in number of units or quality, that could not be delivered under our plan. "Essentially, under the Council plan, Inchicore is to be used to "try out" a particular housing model whereas what Inchicore needs, and needs urgently, is the solution to a number of critical local problems all of which would be resolved by accepting our plan. "While we are participating in the consultative structure that has been established, it appears that Dublin City Council are still in the very early stages of developing the detail of their proposal. In particular, the elected members (that is, the Councillors) have not at any point as yet been asked to give their approval to proceed with any plan. "However, the development can't proceed until the Councillors approve it, so at some point the elected members will have to decide on whether Inchicore should be used for the experiment as proposed or whether it should get the much greater benefits that would be delivered under our plan. "The concept of developing St Michael's Estate in a way which would incorporate a new home for St Patrick's Athletic has been brought together over the past ten years, in the course of which we had considerable engagement with City Council officials. This engagement was always positive and supportive and it's therefore particularly disappointing that, to justify ignoring the benefits of what we have outlined, City Council officials now claim that our proposal would not be consistent with the proper planning and sustainable development of the area. "In reality, our proposal provides a much better solution to the development needs of Inchicore than the alternative option and we will make available to the City Councillors the detailed expert analysis to demonstrate this. "The people of Inchicore and West Dublin will have many opportunities to meet Councillors and would-be Councillors in the coming weeks, as they canvass votes for next month's local elections. We would encourage everyone to make sure that the members of the next City Council, who will decide on this issue in due course, are left in no doubt as to the type of development their constituents wish to see in Inchicore."